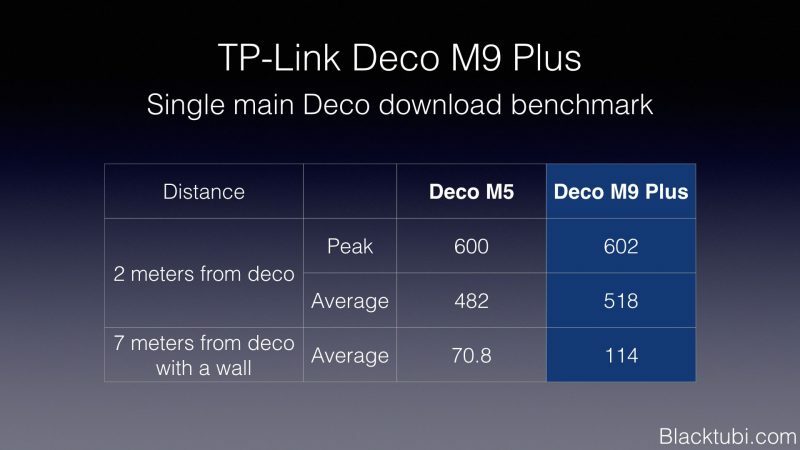 TP-Link Deco M9 Plus is TP-Link latest addition to their Deco lineup of Mesh WiFi system. The Deco M9 Plus is their current flagship model featuring a Tri-Band AC2200 wireless configuration. The addition of another band will provide a significant boost to the WiFi performance. Deco M9 Plus also features smart home support as it comes with the ability to talk to existing smart home devices. 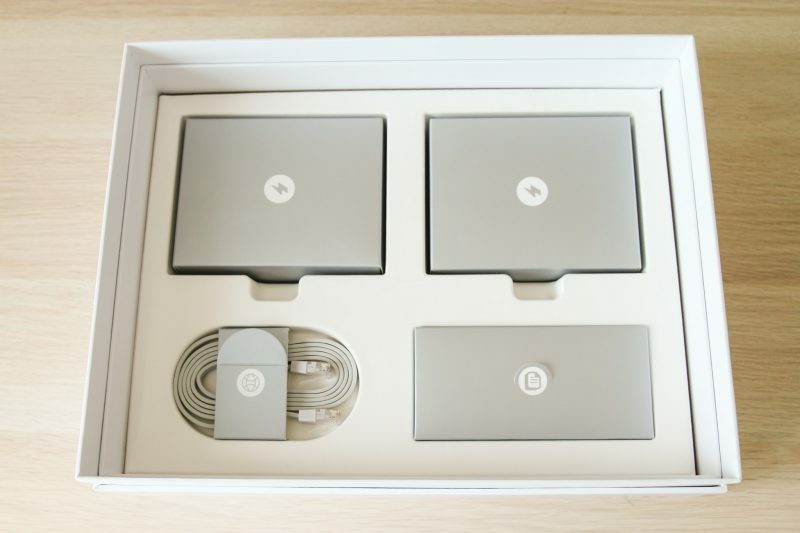 In a mesh wireless system, you get a pack of multiple devices. The Deco M9 Plus I are reviewing is the 2 pack version. You have one of them connected to the modem of your ISP and acts as the main gateway. The second Deco can be placed anywhere within coverage of your main Deco. The secondary Deco will then connect to the main Deco to expand the wifi coverage. Both of them will work together as a single network to deliver the wifi coverage at your home. Mesh WiFi system is also a lot better than WiFi repeaters as a mesh WiFi system is all well integrated. TP-Link Deco mesh systems can be central managed and controlled. Besides, a mesh system run as a single network unlike wireless repeaters. You do not have to try and reconnect your wifi network as you move along your house. 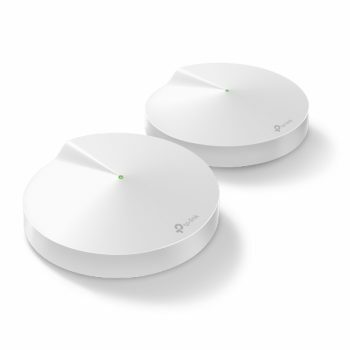 A good mesh WiFi system like TP-Link Deco series features fast roaming and AP steering to ensure your devices is always connected to the best mesh point. The Deco M9 Plus features a very clean design with just a single multicolor LED indicator. As for expansions, the Deco M9 Plus comes with 2 Gigabit Ethernet LAN ports and a single USB port. The USB port is handle if you want to power a smart home device from the Deco device it self. The hardware is the most interesting part of the Deco M9 Plus. The Deco M9 Plus comes with a Tri-band wireless system unlike the Deco M5. It means one of the band will be reserved for backhaul networking. Imagine like a private highway just for the mesh networking and no other devices is allowed. This will significantly increase the capacity of the Deco M9 Plus. It allows the Deco M9 Plus to have a dedicated wireless link specially reserved to expand the coverage. 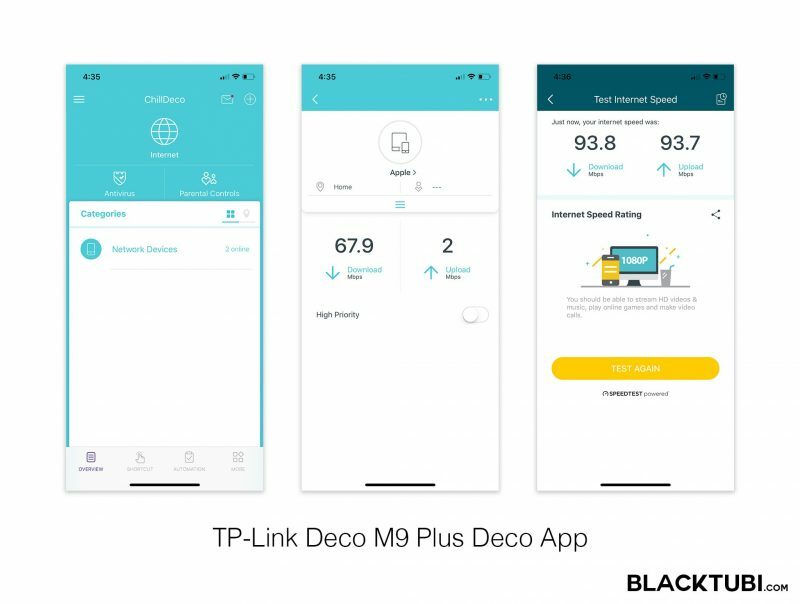 TP-Link Deco M9 Plus is user friendly and easy to configure. Everything can be done via the TP-Link Deco app. Starting from the configuration process, everything was super simple. There is a helpful guide to show you where is the best location to put your Deco device and guide you through the entire process. After adding the first Deco, you can add all your other Deco device to the same network via the guide. The Deco app also provide a lot of options and monitoring ability. The LED can be turned off and there is even a built in speed test tool to accurately check the speed of your Internet directly from the Deco. The monitoring ability is rather interesting. You can see the amount of bandwidth consumed by a device in real time and configure certain devices as high priority. The good things do not end here as the Deco M9 Plus also comes with some handy features. TP-Link Homecare is a suit of features which consist of parental control, antivirus and QoS. I find the antivirus feature really cool to me as it is able to protect all devices connected on your network. Once enabled, a helpful message will be shown when your devices attempting to browse a website containing a malware or virus and they will be prevented from opening that particular website. Think of it like a firewall protecting all your internet connected devices at home. 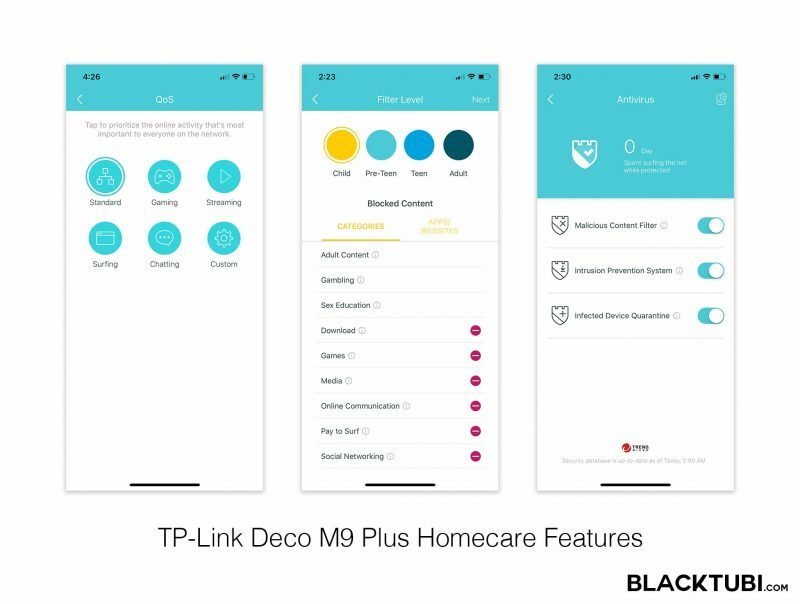 TP-Link Deco M9 Plus is also a smart home hub which support Amazon Alexa and IFTTT. It supports Zigbee and Bluetooth powered IoT devices. I am unable to test those as Malaysia is still a growing smart home market. But, I can see that the feature is well thought off with many triggering options and conditions all controlled on the Deco app. We shall see what potential it has in the future. If there is one thing that I want to nitpick, that would be the Deco can only be configured via the Deco app. There is no web interface to configure the Deco. But, the Deco app is the best router app in the market right now. It comes with cloud built right onto it so you can control your router wherever you are once you are logged in to your TP-Link ID. 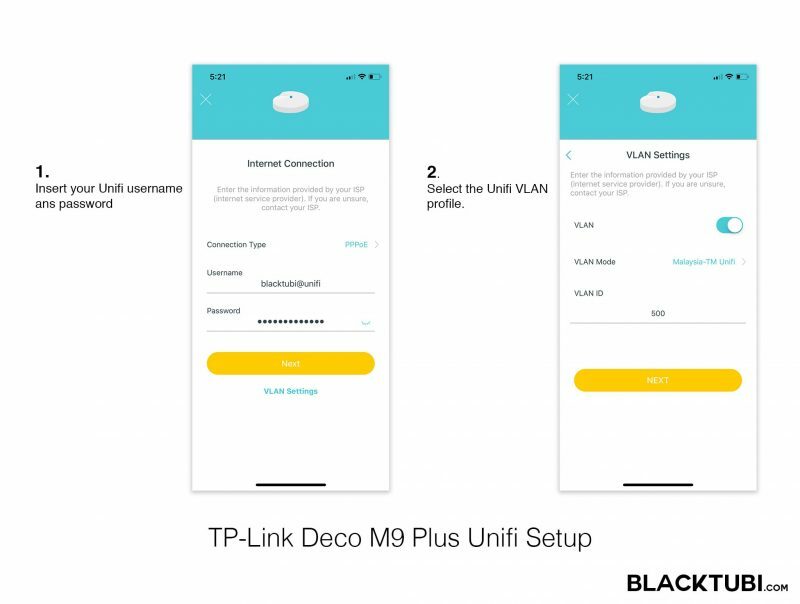 TP-Link Deco M9 Plus is compatible with Unifi and it is selectable in the app. The configuration is very simple, you just connect the Unifi modem to any port on your Deco and follow the setup guide on the app. The app will prompt you to insert your Unifi PPPOE username and password. Make sure you tick VLAN and select the Unifi profile in the app. However, the Deco do not support HyppTV at the moment. This is possibly due to the lack of ports on the Deco. 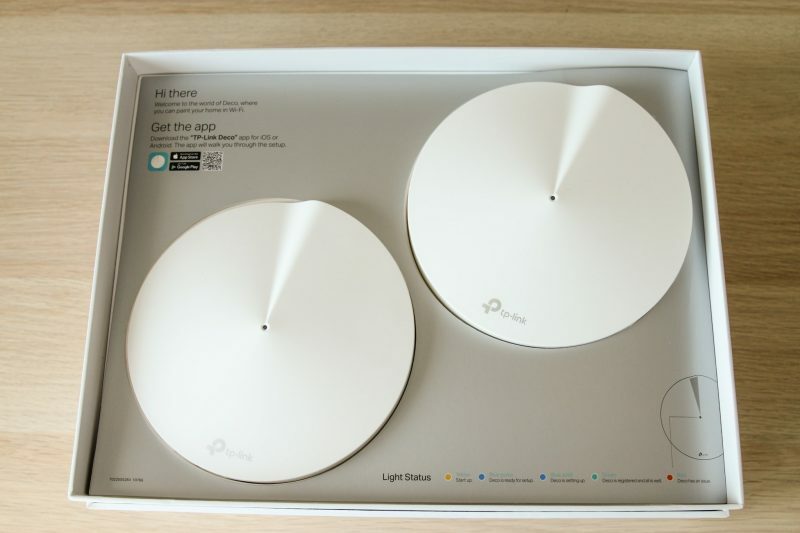 TP-Link said they working on a solution for this. But rest assured, the Internet works fine so the Deco M9 Plus is still a good purchase if you don’t use HyppTV. Well, we have talk about how good is the specifications and how good the usability is. But, non of that matter if the performance is not up to par. First, we tested the peak performance of the Deco at a standalone mode to see how fast they can reach as a single device. But, what matter is how we can benefit from the mesh system and the speed improvement with a mesh system. So, we tested the wifi speed at the kitchen with just the single main Deco. Next, we added the secondary Deco at the kitchen and conducted the speed test again and see how a mesh system can help. 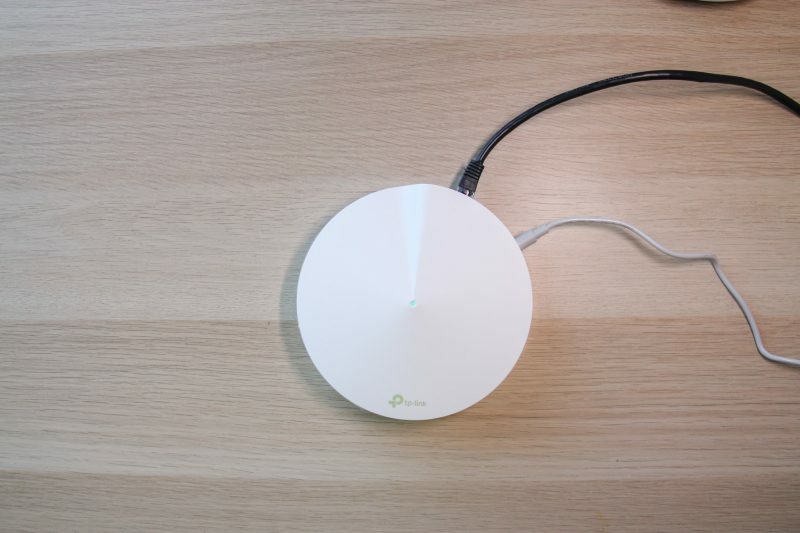 For the sake of comparison, we also tested the TP-Link Deco M5. The performance of both Deco M5 and Deco M9 Plus is quite similar on single device mode. On our test setup with the main Deco at short distance, we have no problem averaging at 518Mbps over wireless with my AC1200 laptop. After a distance of over 7 meters and 1 concrete wall, the speed is left around 114Mbps. 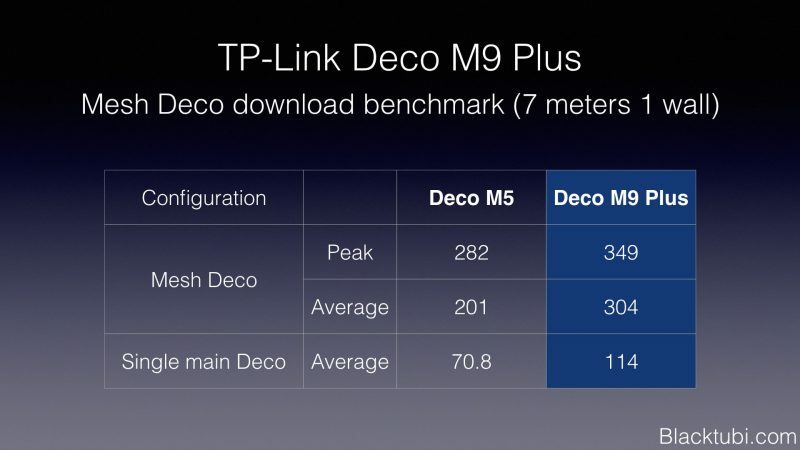 The Deco M9 Plus is slightly faster than the M5. On to the mesh performance after the secondary mesh Deco is introduced to the network, we see an improvement of wifi performance up to 200% on the Deco M9 Plus. We can see that a mesh wireless system can not only improve the wireless coverage, it can effectively increase the speed of your wifi network throughout your property. The Deco M5 with a dual-band wireless is also impressive but at a more modest 130% improvement. We are interested to know the NAT performance of the Deco M9 Plus since Malaysia is getting close to Gigabit Internet now. The peak speed that we can obtain when the Antivirus disabled is 620Mbps. It means that the Deco M9 Plus should be used with an Internet plan up to 600Mbps only as it cannot handle more than 600Mbps. We also tested the boot up time by timing the time taken for the mesh network to be usable from a fresh boot. The main Deco boots in 56 seconds. The secondary Deco uses the same time to boot but it needs more time to connect to the main Deco and establish the mesh network thus, the longer bootup time on the secondary Deco. Like your mobile phone, roaming happen when you walk from the coverage area of a Deco to another Deco. Roaming is really important as you want your device to be connected to the fastest Deco at all times. You also do not want any downtime when your phone is switching over to the coverage area of another Deco as you walk around your house. This is where the Deco M9 Plus shines as it supports the 802.11r, k and v fast roaming standards. It lets you to walk from the coverage of one Deco to another with minimal disconnection. 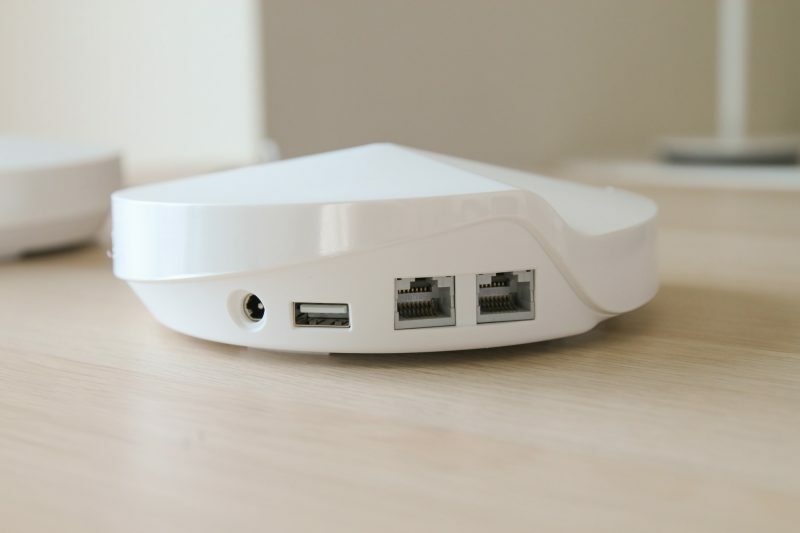 Besides, the 802.11r also ensure that your phone is always connected to the best access point so you do not need to figure that out and keep turning your wireless on and off. Currently, most other mesh solutions in the market which rely on their own roaming system as 802.11r is typically only being used on Enterprise wifi gear. I think the TP-Link Deco M9 Plus is easily the best mesh wireless system that I have tried so far. The technology is mature enough and properly implemented. I also love the nicely designed, modern hardware as it looks clean in a modern household. The performance is equally as impressive as well. I am satisfied by the performance and I can say that it is compatible with Internet plan up to 500Mbps. Besides, the software running the Deco M9 Plus is also really important. 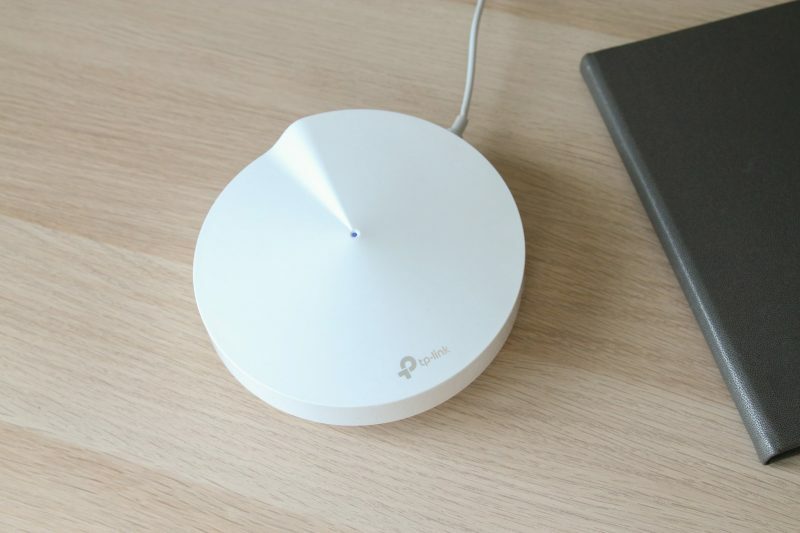 TP-Link simplified the setup process and make the complex technology almost invisible to the users. TP-Link Deco actually work really well and feel really polished unlike mesh systems from other brand which may be buggy. It also comes with the Homecare suite of features which is handy. TP-Link expertise in Enterprise networking can also be seen here with the 802.11r fast roaming support. Another bonus point I would give is due to the compatibility with Unifi. You can even select the Unifi profile right from the app without the need of using a computer and select the VLAN. Well, HyppTV is not compatible yet but TP-Link is working on it and expect a firmware release soon. But, if you do not use HyppTV, the Deco M9 Plus is almost the perfect mesh wireless system in the market right now. 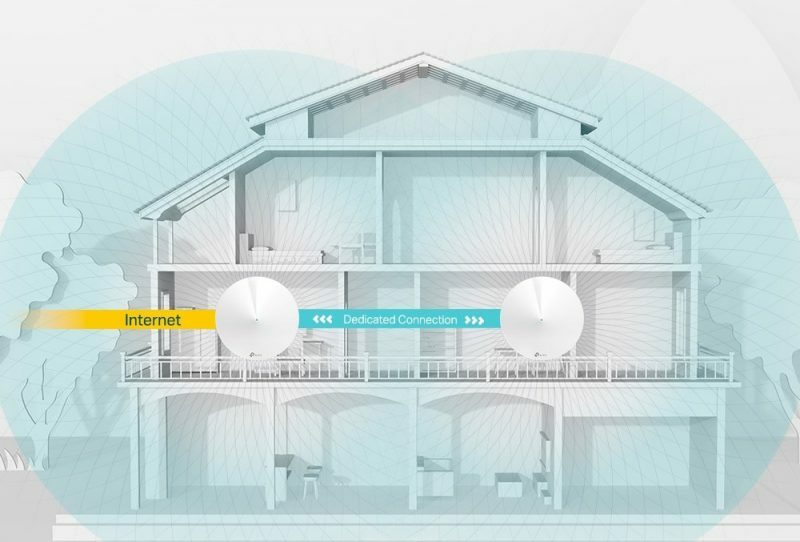 I highly recommend investing a Mesh wireless solution if you stay in a bigger house and you demand for good wireless coverage and performance throughout your home. Best mesh wireless system you can buy in Malaysia now. The performance and stability of the mesh network is unbeatable. I recently purchased the M9 with your review being a big part of my decision making. A very big thank you for that. I am however, interested in purchasing a smart lock. Wither the August Pro or the Kwikset Kevo with both devices having bluetooth connectivity. I posted questions to TP-Link, August and Kwikset but they cannot confirm whether the smart locks can connect directly to the router via bluetooth and hope you can advise me. Both of the smartlocks have Wifi Bridges sold separately to connect to the internet but i was thinking to cut out the middleman and connect direct. Looking forward to your response and keep up the good work! Hi. I’m planning to change my original router from TM (Acher AC1200) to a better one. Currently upstairs was old modem from previous streamyx repeater. FYI my UNIFI PLAN was 500 Mbps. Any recommendation? Living on 2 storey. Deco M9 Plus if you don’t watch HyppTV. If the second deco m9 at the first floor is connected to lan cable does the internet speed improve? Definitely, having Ethernet backhaul will definitely help with speed. Hi it’s confirmed Ethernet backhaul is suported by the M9 plus? Tp link really surprised me with this one. I returned my lyra and get this. Im using this + p7. Work like magic!! 1. Mesh wifi improving speeds, but does it affect latency? 3. Just wanted to confirm compatibility with Maxis? 1. Wireless will definitely affect latency but it depends on signal and interference. For my case it fluctuates between 2-5ms more than wired LAN. 2. LAN will be the best but wireless is decent as well. 3. Compatible with Maxis but existing router is required. The Deco series do not have VLAN tagging ability yet. im planning to switch to new router and this was a good review ,but i need to know is it HyypTv will be definitely made available on this device. TP-Link claims that it will come in a firmware update. I just got a deco m9 but having issue during setup. 1. I removed Dir850L and swapped with one deco. 2. Followed the app step. Set up the pppoe unifi id and password (new password from tm). 3. Set up WiFi which connected. 4. It keeps saying can’t connect to Internet despite multiple reset . This is my issue. Not sure what I could do because it seems the issue is from the router not connecting.